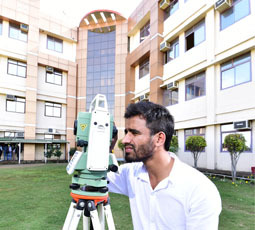 The college took a plunge into the immensely refreshing and challenging field of Civil Engineering with the setting up of the Civil Engineering Department, right from the genesis of the college. The department ensures not only that the courses are updated, but also that they reflect the current needs of commerce, industry and the society as a whole. 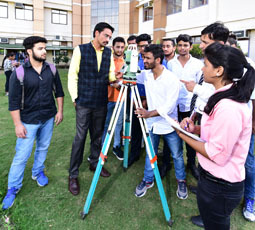 The Department of Civil Engineering is newly added programme with high quality technical manpower that needed by industry, R&D organizations, and academic institutions. 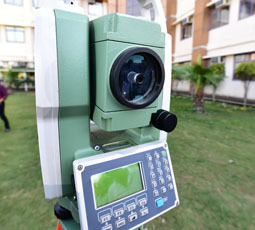 The Department offers B.Tech. Civil Engineering. The academic activities are so planed so that Department emphasizes deep understanding of fundamental principles, development of creative ability to handle the challenges of Civil Engineering, and the analytical ability to solve problems which are interdisciplinary in nature. The Civil Engineering Career Field is a contingency related career field. Structural and pavement activities, including construction and maintenance of structural facilities and pavement areas; maintaining pavements, railroads, and soil bases; performing erosion control; operating heavy equipment; structural and metal fabricating, construction, and maintenance; engineering specialists; and operations functions. Utilities systems functions such as operation, maintenance, repair, and construction of plumbing, water, and waste water systems and their components; fuel system maintenance; and pest management.